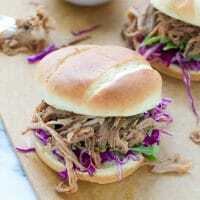 Moist, delicious and flavorful slow cooker pulled pork sandwiches. So simple to make in your slow cooker. In a small bowl combine salt, pepper, paprika, cumin and oregano. Rub pork with the mixture of spices. Rub with brown sugar. Place meat in the slow cooker. Add garlic, bay leaf, pour juice, chicken stock and tomato concentrate. Cook on high for 4-6 hours. Remove meat and transfer to a cutting board. Using 2 forks shred the meat. Transfer back to the slow cooker to keep the meat juicy. Once ready to make the sandwiches, combine meat with some barbecue sauce. Season cabbage with salt, olive oil and apple cider vinegar to taste. Assemble sandwiches, placing the cabbage and arugula on the bottom and meat on top. Enjoy!